"Polar station" redirects here. For analogous stations in Antarctica, see Research stations in Antarctica. Historically few research stations have been permanent. Most of them were temporary, being abandoned after the completion of the project or owing to lack of funding to continue the research. Some of these facilities are constructed on land or on ice that rests on land, while others are drifting ice stations built on the sea ice of the high latitudes of the Arctic Ocean. Ice Station -- Impossible!, an episode of The Venture Bros.
View of the Polish Polar Station, Hornsund. View of the Arctic research station on Vize Island. View of the Igloolik Research Centre, Igloolik, Igloolik Island, Nunavut, Canada. ^ "North Pole drifting stations (1930s-1980s)". Woods Hole Oceanographic Institution. Retrieved 30 April 2009. ^ Stensdal, Iselin (2013). "Asian Arctic Research 2005-2012:" (PDF). Fridtjof Nansen Institute. Archived from the original (PDF) on May 3, 2014. Retrieved May 2, 2014. ^ "Polyarnaya Stantsiya Solnechnaya". Mapcarta. Retrieved 19 December 2016. ^ Luhn, Alec; Hunt, Elle (14 September 2016). "Besieged Russian Scientists Drive Away Polar Bears". The Guardian. Retrieved 14 December 2016. ^ Bassford, Robin; Siegert, Martin; Dowdeswell, Julian; Oerlemans, Johannes; Glazovsky, Andrey; Macheret, Yuri (February 2006). "Quantifying the Mass Balance of Ice Caps on Severnaya Zemlya, Russian High Arctic. I: Climate and Mass Balance of the Vavilov Ice Cap". Arctic, Antarctic, and Alpine Research. university of Colorado. 38 (1): 1–12. doi:10.1657/1523-0430(2006)038[0001:QTMBOI]2.0.CO;2. Retrieved 13 August 2015. ^ Сайт Лаборатории популяционной экологии ИПЭЭ РАН - Енисейская экологическая станция "Мирное"
^ Скалина, Ирина (10 July 2008). "Опасный дрейф; Полярников эвакуируют на судне "Михаил Сомов"" (web). "Российская газета". Retrieved 2008-07-12. (Russian/English) Skalina, Irina (July 10, 2008). "A dangerous drift; Polarnik evacuated on the ship "Mikhail Somov"" (web). Google Translation. Rossiyskaya Gazeta. Retrieved 2008-07-12. 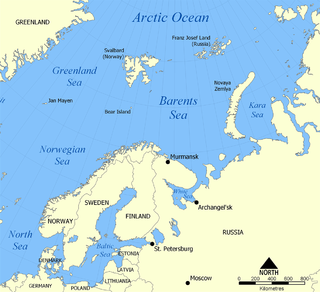 The Barents Sea is a marginal sea of the Arctic Ocean, located off the northern coasts of Norway and Russia and is divided between Norwegian and Russian territorial waters. Known among Russians in the Middle Ages as the Murman Sea, the sea takes its current name from the Dutch navigator Willem Barentsz. 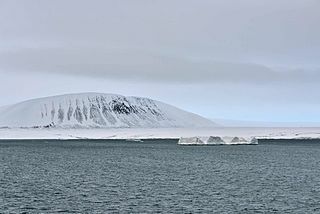 Komsomolets Island is the northernmost island of the Severnaya Zemlya group in the Russian Arctic, and the third largest island in the group. It is the 82nd largest island on earth. About 65% of the island is covered with glaciers. October Revolution Island is the largest island of the Severnaya Zemlya group in the Russian Arctic. 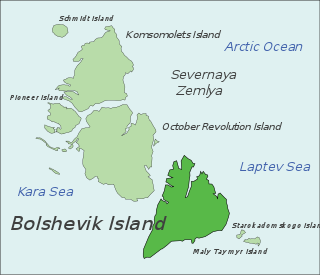 Bolshevik Island is an island in Severnaya Zemlya, Krasnoyarsk Krai, Russian Arctic. The Heiberg Islands, spelt Geyberg, Gejberg or Geiberg is a group of four small islands covered with tundra vegetation and with scattered stones on their shores. 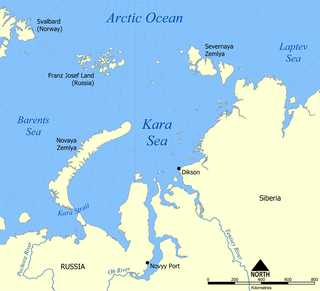 They lie in the Kara Sea, between the bleak coast of Siberia's Taymyr Peninsula and Severnaya Zemlya. These islands are between 35 and 45 km from the continental shore. Cape Unslicht is a headland in Severnaya Zemlya, Russia. Solnechny Bay, is a bay in Severnaya Zemlya, Krasnoyarsk Krai, Russia. Cape Baranov is a headland in Severnaya Zemlya, Russia. The Arctic desert ecoregion is a terrestrial ecoregion that covers the island groups of Svalbard, Franz Josef Land, Severny Island and Severnaya Zemlya in the Arctic Ocean, above 75 degrees north latitude. The islands are covered with glaciers, snow, and bare rock in a harshly cold environment. The temperature does rise above freezing for short periods in the summer, so some ice melt occurs, and the area supports colonies of sea birds and mammals. It has an area of 161,356 square kilometres (62,300 sq mi).